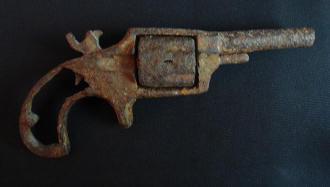 Unidentified Antique Dug-Up Spur Trigger Birdshead Grip Pocket Revolver. Rust encrusted dug up from unknown site. Trigger frozen in cocked position. Appears not to be loaded. Looks to be .31 or .32 caliber pistol. Nice historical piece.